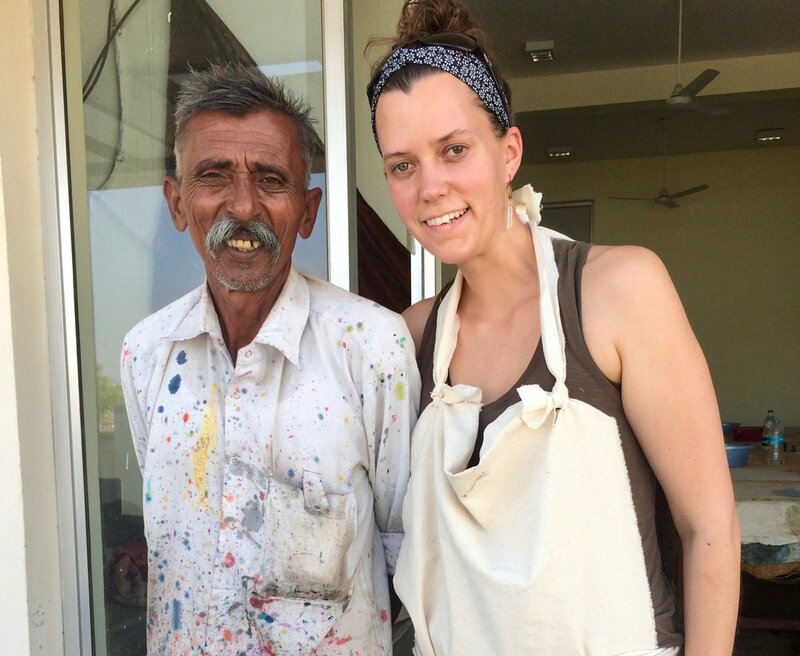 In October of 2015 I traveled to Jaipur, India to learn traditional block printing methods first hand. While the materials and tools I use to carve my own blocks are more modern and accessible, what I loved the most was witnessing the master carvers and printers in their home environment. Traditional block printing facilities are called workshops, and of the few we visited, both were similar as they had office type areas in the front of the building, and large sections of work areas in the back. They didn't feel like massive or impersonal production facilities though, they had tall ceilings, decent lighting, and natural ventilation. As you can see in the images from inside this particular traditional workshop - I loved witnessing their humble efficiencies and sense of organization. Rounds of wood waiting to be carved into blocks, pots and pots of dye and ink in a corner, ink trays and an expanse of tables with printed textiles in varying states of completion, with blocks stacked tidy on shelves and the ink trolley waiting below when not in use. It looks a bit exotic maybe, but it also felt just orderly enough to believe it, unlike all the staged studio shoots overtaking our social feeds. There is something incredible about the immersive nature of attending an art retreat in a foreign country - I was only in India for two weeks, but I wrote sketchbooks of notes (with drawings) and brought back as many museum curatorial guides as I did textile samples. If there is anything I love as much as making with my hands, it is reading about the stories and learning the history and culture behind the making of others. And you don't have to leave the country to discover the stories or learn the techniques. The public library and the google are literally my best friends, and I'm always watching to see if I can learn something new from someone in my community. When I sat down to write this post, I wondered what I could ever really add to this story, or how I would explain the techniques that I've only engaged in and witnessed for a brief moment in time. I think that is all that we can really expect from ourselves. I will never be a true artisan wood block carver or a master printer, that is not my lived experience. But I can interpret the world around me in ways that are personally meaningful to me. I can continue to learn new skills and follow my curiosity, mixing influences and art forms until my process and my work feels uniquely my own. I challenge you to never stop exploring the fascinating and exotic places that exists within yourself.